For my first Martini Moment of 2019 instead of a drink recipe I though it would be great to start the year out with some ways to keep your drinks smart and low cal. Typically I try to save my wine and those calories for the weekend. One of the reasons I started drinking martinis in the first place was a low calorie content. So today I’m sharing 5 tips to drink a little smarter. 1. This might be the most important one: never use those sugary drink mixes! Juice lemons, limes, or grapefruits as they are much, much lower in calories. 2. Pick a “going out” drink. I never drink wine when out because I’m not paying $10 for one glass when that’s more than the bottle they have (I’m talking bars and such not nice restaurants). So I always order a Vodka Soda with lime. Not much sugar and not $10. 3. Stock your house with drink fixins’ that you know are low cal. La Croix is a good option or I also use flavored Perrier. I’ll mix that with vodka and splash with Pomagranet juice. 4. Drink lighter colored liqueurs. Think vodka, gin, or white tequila. Your body can process these easier. 5. Know the exact calorie count. For example, 2 ounces of gin or vodka has 130 calories in it. If you’re splashing a little La Croix in there that’s nothing. If you wanted to sweeten up a drink 1 tsp of sugar is only 16 calories. So let’s get this weekend started! Now we can all sip a little smarter and have some guilt free cocktails! Hello and Happy National Wine Day! Now I love me a made up holiday that's for sure. And you know I won't ignore this one! I wouldn’t be me if I did. As I was thinking about a wine post to do I was thinking about the things I learned about wine and how it would be helpful to those who might not know. Here are three things to know about when drinking your favorite glass of vino. On your wine that is. When you swirl your wine two things happen. First it releases the aromas of the wine so you can better taste it. Second, you can see wine drip down the sides of the glass those are called the legs. The longer they take to fall the better the wine is. but did yo know when you do this your mouth should be open? Try it. Smell it once with your mouth closed and again with it open. Huge difference. My last tip is to zone in on one region you really like. For myself and MK we really love Spanish and Argentina wines. But out favorite is Rioja wines. So after you find your wine, see what pairs well with it so you always know what to order with it when you’re at a restarunt. Lucky for me tapas goes perfect with this wine. Think Cantaloupe and Prosciutto combo or a Fig Crostini. Yes please! I hope your Memorial Day weekend is jam packed full of fun and vino! I started the week with a lemon in my water and ending it with a lemon in my drink! Spring is so close (I can't see you snow) and the smell of fresh cut lemons just reminds me of that fact. It's no secret that I love fancy. Add fancy to a drink and I'm all over it! For today's Martini Moment, I'm showing you how to fancy up your drink and make a fast and easy twist. Along with a super delicious Lemon Drop recipe. Because this is how a Friday should be celebrated. With a fancy drink in hand. Step 1: Get a lemon. See? Easy already. 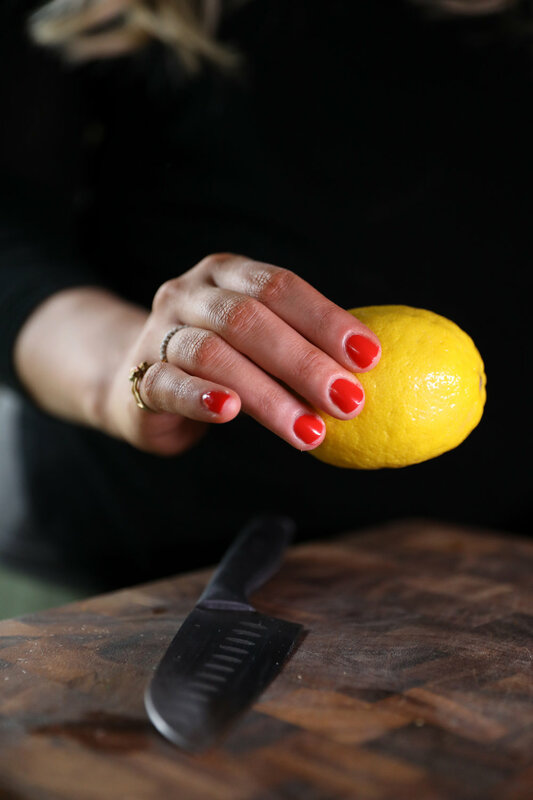 Step 2: Cut off the ends of the lemon. Step 3: Using a bar spoon or knife (I ended up using both) hollow out the lemon. 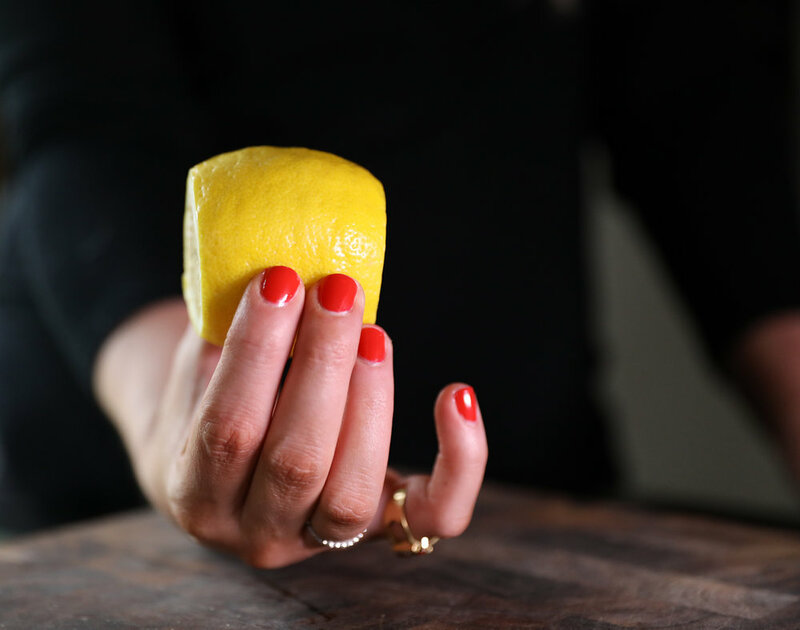 Step 4: Roll up your lemon skin. Keep in mind some are more thick than others. 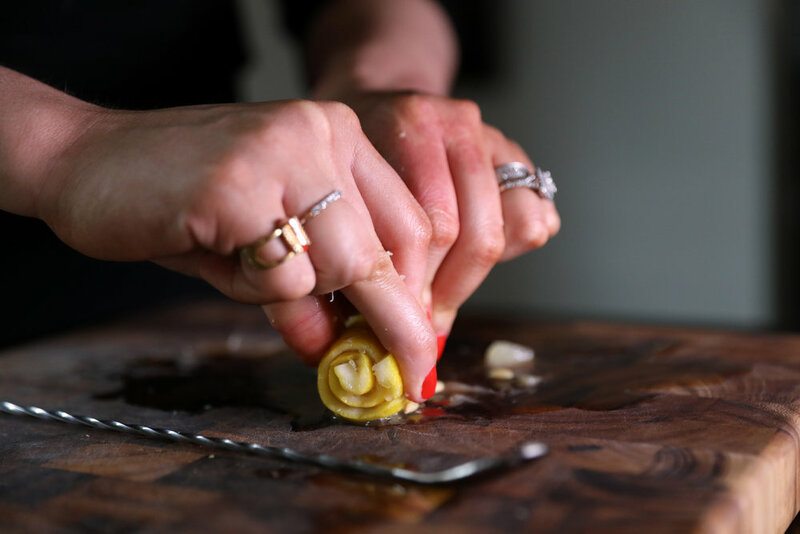 Step 5: Cut your rolled lemon peel into whatever size twist you want. Fill a shaker about half with ice, throw everything in minus the rim sugar. Shake until your teaspoon of sugar is dissolved. Before pouring take a lemon around your rim and dip in sugar. Then pour in your shaker of goodness. Add your twist and sip! Quick tip: if you like a sweeter drink add more sugar and a little less lemon juice. Cheers, and have a fabulous weekend!